Despite being around for decades, virtual reality (VR) has had some difficulty hitting a mainstream gaming audience. Whether that's down to expensive headsets, a limited library, or just a general lack of appeal, gamers (and developers) just weren't invested in virtual reality as a viable platform for 'true' gaming experiences. However, in recent years, the jaded perception of VR has slowly started to lift. As the technological possibilities increase for the platform, game developers have began to take the medium more seriously, creating more games specifically for VR. It's a move which has seen the likes of the Oculus Rift, HTC Vive, PlayStation VR and Oculus Go going from strength to strength and titles such as Astro Bot: Rescue Mission and Tetris Effect garnering critical praise. But what's in store for the future of VR gaming? Well, there's nowhere better to find out than CES 2019. Luckily, we scoured the halls for the best upcoming virtual reality tech you can expect to see in the future. HTC have become one of the most well-known names in virtual reality gaming, with the HTC Vive and HTC Vive Pro proving to be two of the most popular headsets on the market. But the company isn't ready to stop there, alongside the myriad of announcements HTC made at CES, there was also news of what the brand is getting up to in terms of VR - which is quite a lot it seems. Arguably the most interesting is its new HTC Vive Cosmos VR headset, which can be powered by more than a PC and offers the VivePort Infinity service, which was described by HTC head Drew Bamford as 'Netflix for VR titles'. The problem is, HTC didn't actually reveal when we can expect to see the headset and this service - or how much they'll cost - so we don't actually know all that much. We don't even know what the resolution will be or how the headset will work, but the prospect of a new gaming-focused headset is definitely interesting. In addition, we can only hope that more big-name VR titles start to emerge as the likelihood of users signing up to a subscription service such as VivePort Infinity without being offered a decent-sized library is slim. HTC is not the only company offering innovative new virtual reality technology. Pimax has revealed its ‘8K’ ultra-wide high-resolution VR headset is set to ship in February, a prospect which almost seems too good to be true following some delays post-successful Kickstarter. 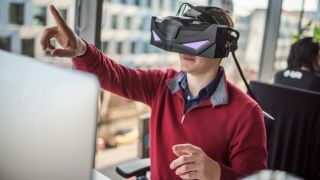 The headset will finally allow for peripheral vision in VR, however the ‘8K’ name is slightly deceptive considering the headset actually has two 4K lenses (one for each eye), and each is technically 3,840 x 2,160 upscaled from 2,560 x 1,440, according to VentureBeat and LinusTechTips. It's still pretty impressive, providing a 200-degree field-of-view (while the likes of the HTC Vive only provides 145-degrees), but it's definitely pricey - costing $899. Despite all this, there's no denying the Pimax '8K' is paving the way for VR headsets with more immersive gaming experiences - with larger FOVs, better frame rates and better resolution. We are a slave to social media, and VR is no exception. Oculus Rift is choosing to ride the wave rather than swim against it, announcing an update which will allow users to live stream their virtual reality shenanigans to Facebook - something which is likely to benefit streamers. The update is currently available on the public test channel and is expected to roll out to all users at the end of January. However, the feature only works with certain apps and games - with developers having to opt-in and support the live streaming feature. How many choose to is yet to be seen. In addition, the update adds Public Homes. This means that others can visit your virtual home, if you so choose. But don't worry, you can decide who is (and isn't) allowed in. The idea is to allow people to make new virtual reality friends with shared interests. To be honest, this is more of a novelty idea but could definitely pave the way for more virtual reality social spaces.